My Instagram explore page is 90% dog videos and 10% No Context Louis Theroux posts. I lose hours of my life watching Huskies try to find their hiding owners and German Shepherds catching treats in slow motion (with hilarious consequences, obvs). What I’m saying is, I can and do watch the most banal of dog-related content, so praise be to Netflix for creating some beautifully shot, tear-inducing, quality canine TV too. Their new six-part anthology series Dogs follows furry subjects in countries around the world and documents the bond they have with their humans. 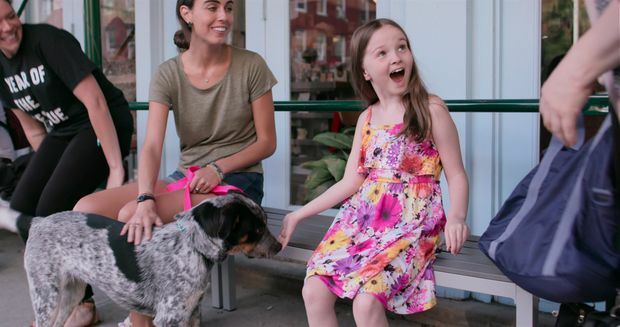 The first episode feels like the most familiar territory of the docuseries, as we follow Corrine, a young girl with epilepsy and Rory, her new service dog as they get to grips with the rigorous training process, and each other. Each instalment from then on enlightens viewers on more complex situations, like the Syrian refugee Ayham who is struggling to bring his beloved husky Zeus to live with him in his new German home, and the Costa Rican sanctuary for literally hundreds of abandoned dogs, which, quite frankly, exists in absolute chaos and on very little money. The series has successfully created the most heart-wrenching internet dog video of all time. But more importantly, the stories are ultimately very human and serve to highlight social issues, cultural differences and human suffering and shows just how our dogs can help us through them. They're good dogs, Brent.